“How is Farty Barty?” I hear you say and I realise that he has not had a mention for a while. You may recall that Barty is a semi-wild cat and he has asked me to remind you that he should not be confused with the domestic varieties that go and have their bits chopped off and lounge around getting fat for the rest of their lives! In this respect I hear a lot of argument, but if every vet had their way, they would wipe out Tuscan wild cats by neutering and castrating willy-nilly. Excuse my play on words. 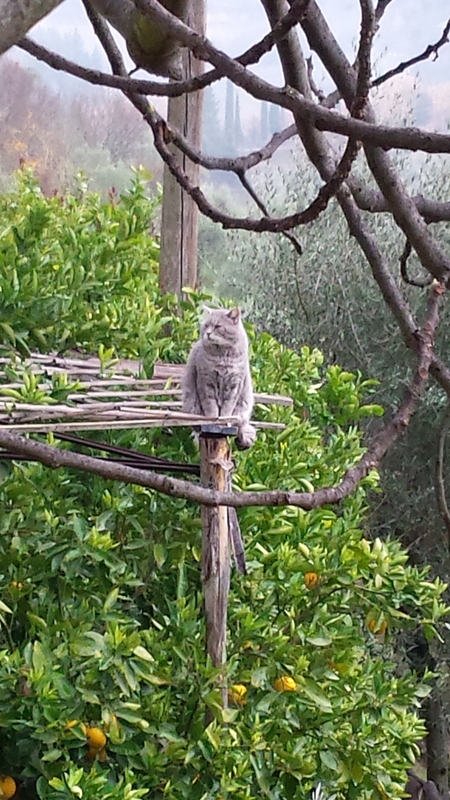 So now at the age of nine, Barty can honestly say he has had and will continue to have, a good life with a free hotel for the occasional meal and recovery in a soft cushioned wicker chair, before going back out there into the Chianti hills and living the life of Riley. Sometimes he is gone for days, so we are always pleased to see him when he trots in, acting as if he as if he had only been gone a few hours! A gorgeous designer dress from Florence. 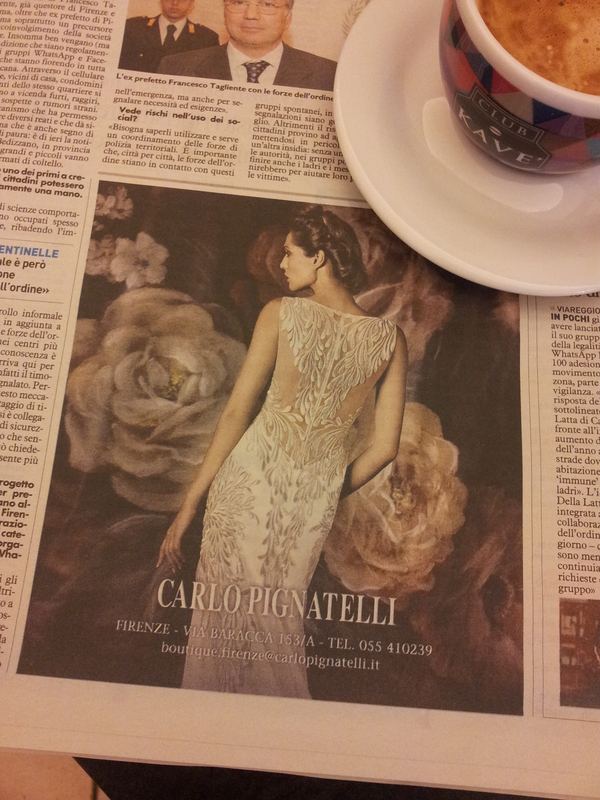 Back in Certaldo enjoying our morning coffee, I read an advertisement for a beautiful dress designer shop in Florence. Now, as I have said before, I do believe that the Italians have the edge on fashion design, and this is a reminder. I will be going to Florence the week after next and will spend a couple of hours drooling over the shop windows. Yes, we have other labels here from all around the world, but there is no comparison with the handbags, shoes and clothes made in this beautiful country. unemployment is high, but if you are blessed with the skill of creative design, you will survive here. 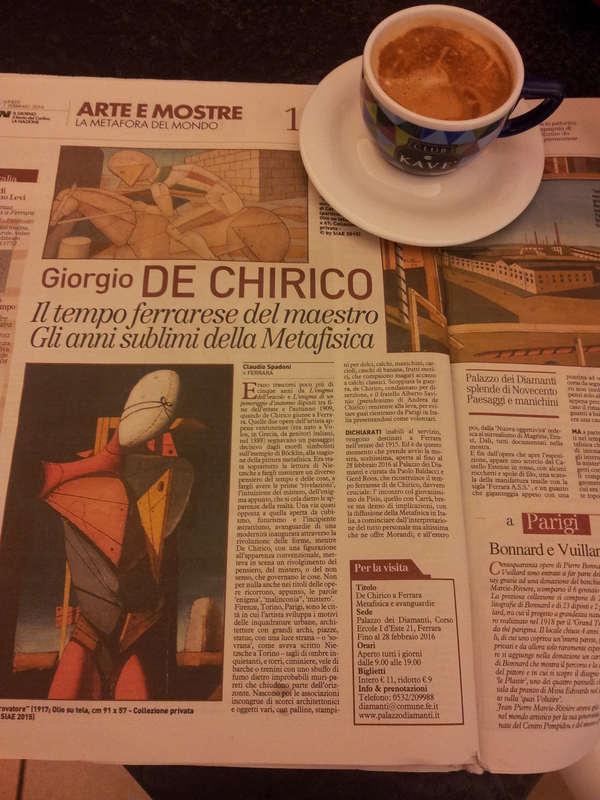 Giorgio De Chirico exhibition in Ferrara. “Oh, look at this!” My man says as he thrusts his newspaper towards me. “A private art collection has been discovered and its being exhibited in Ferrara. It’s that amazing early twentieth century style, symbolism I think, and these were painted by Giorgio De Chirico.” I look at the pictures, we both like this style and note down the website. It’s a little too far for us to visit, but it’s great to read about new amazing discoveries like this! I have just checked out the latest on the gorgeous Silvio and there is nothing of interest to report. This year he will be eighty so it will probably be his last throw at getting re-elected this time round. Watch this space….. The stunning ‘Patty Pravo’ age 67 and other aging girlie rockers! So instead I will mention two other icons that are currently on tour in Italy, Brian May, the former Queen Lead Guitarist and Bruce Springsteen, also known as the boss. Now it always gives me immense pleasure to see the Aging Rocker tours sold out in Italy. My also being one, of course, although much more low profile. I am still waiting to be discovered, but despite that will keep up the annual concerts in our garden, where the locals treat me like I’m world-famous! There’s nothing like being Famous in Fiano! 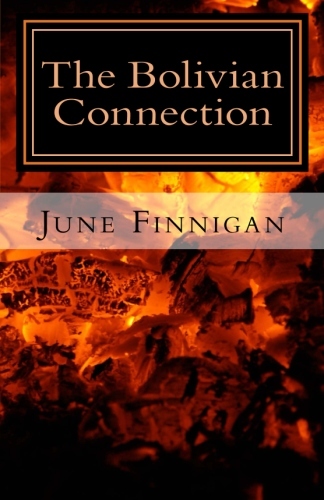 OK, so I must revert back to writing the CyberCrime thriller, which I have been commissioned to do and of course the third book in the Joanna Wilde Trilogy, ‘The Italian Connection.’ I also read a lot, which is important for authors, and have just discovered a writer called Charles Todd who has written ‘A Test of Wills’ about Inspector Ian Rutledge. 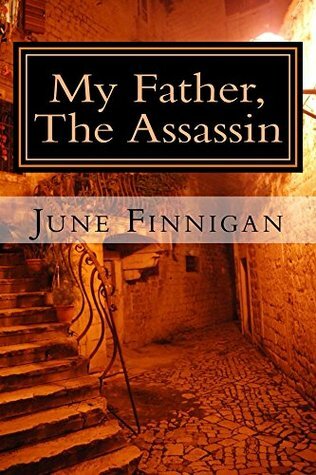 It is set in the years just after the First World War and I am really enjoying it. Commissioned to write a cyber-thriller! Sounds good. Details, please. Yes, am thoroughly enjoying this opportunity. Can’t say too much, but it is loosely based on my client’s own experience. We have recruited a professional mentor to achieve best results for going to market. Watch this space!